Webspikel famous for attractive web design with cost cutting package and plan.its provide complete package plan for dynamic website with Domain name,Web Hosting with cpanel,Dynamic responsive design and SEO friendly website design development in Patna.We are designed website which tailor made specially for you. Our Website Design to Represent your business to understand your service & Product. we are delivered all type of website in Patna like E-Commerce Website Design,Static Page lay-out Design,Dynamic Website Layout,Responsive Website Design,Fluid design Layout and SEO friendly website which have not only run they real work and fulfill your requirement in Proper way in digital world with and lass with online payment gateway,SSL secure and complete maintains with our expert webspikel Team in Patna. Friend website designing and development main part of your need, complete website design and development means Maintains and update security is one of main and core part of website hence webspikel provide you complete package and plan yearly no need to pay any amount time to time . which have work smoothly and fulfill your digital requirement . 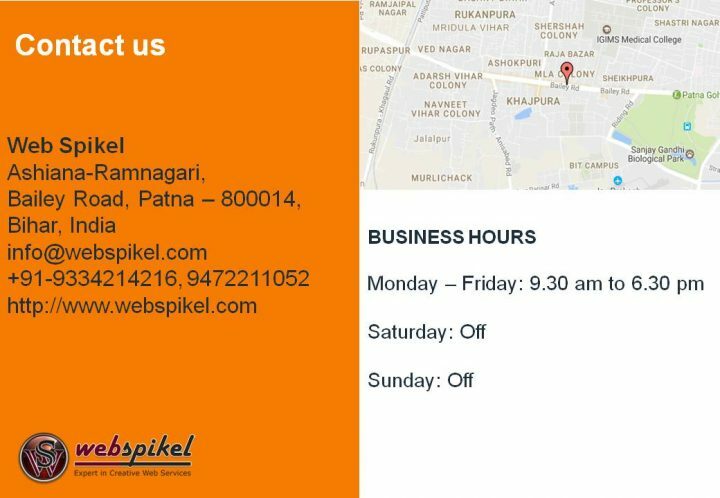 If you are looking for fabulous website designer in Patna one of the best option is webspikel.com because they had not only worked and complete their task its love web designing.